Gertie's New Blog for Better Sewing: Next Step: Accessorize! Readers, this next sew-along step is VERY IMPORTANT. 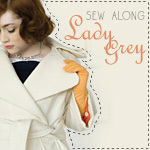 Wouldn't you agree that the Lady Grey coat is just begging for glam accessories? So, I don't want you to get so bogged down in your impeccable pad stitching that you forget this crucial step of planning your accoutrements. Being the self-indulgent type, I went ahead and bought myself a couple pretty little things to complete my look when my coat is finished. I'm pretty sure I deserve it. The first step was gloves! The bracelet-length sleeves of the Lady Grey are perfect for showing off a pretty new pair. I opted for the grey ones below (love those lavender buttons!) from ModCloth. They also come in red! Luckily, long gloves seem to be in style these days, so it's not hard to find a pair that will go up above your wrists. Etsy is practically crawling with vintage brooches to be had for cheap. How will you be accessorizing your Lady Grey? Cute gloves! I have very wide hands and find I can only wear knits or men's gloves. I'm currently making a darkish red New Look suit and although I love 3/4 length sleeves, I was considering going full length because of the absence of cute long gloves in my size to keep my hands warm this winter. You have now solved my problem and these in the red will be perfect with the 3/4 sleeves, thank you! Oh, and that owl brooch is equally cute. Love it! I already knitted a hat for it! Love the gloves! I'm looking forward to seeing the complete look. That owl brooch! I'm a sucker for brooches of animals. And I was thinking about buying long gloves but also have large hands and I live in Japan for now *sigh* I'll have to wait. BUT, that pic of Emma makes me want to sew a tam with my extra fabric and lining (I have enough for a skirt as well). Perhaps too matchy matchy? pillbox hat. I'm going to make a pillbox hat out of the same fabric. Tams forever! I will definitely be sporting my favorite little Etsy-bought sage green tam. I'd love to scrounge up some complementary gloves. As with everything, I will be accessorizing with white basset hound fur. Other than that, I just realized the other day that I've been plodding away on a scarf with slubby orange wool (for like 2 years, scarf knitting is BORING!!) and I have the wool for matching mittens too! I'm not sure if the granola thick/think hippie-vibe yarn will work with the coat, maybe! I'm still planning on getting belt made - I was waiting to cut the last of my fabric before sending off to Pat for that! My mom is making this coat too, so I just bought her cute little black leather gloves with bows on them for her birthday. woo! thank you for this post! I had finished my lady-grey inspired coat last week and i had been looking on etsy for a pait of white leather glove thats the perfect length. no luck yet. but those lavender buttons would go PERFECTly with my lavendar beret, which is perfect to wear with my purple coat! :D:D more brooches! woohoo! After hemming my Lady Brown, it suddenly seemed as though it will fit sort of perfectly (as opposed to not at all, as I discovered a few days ago). My style is much more Little Rascals than Lady Grey. Or maybe a Little Rascal goes riding with Betty Draper. Heh. I have the perfect fingerless gloves, oxfords and wool newsboy cap, but I'll soon be making some knickers. I've got the bracelet gloves and a cute little broach! I've even got a fur pillbox hat. So I'm ready. But all my limiting crafting time is being taken up with the coat itself! Luckily, it doesn't get very cold in SF. Well come to think about it, if and when I finish the coat I have long black leather gloves, a black hat and I'm sure I can find a suitable pin some where around here. Oh yeah and I recently bought a black scarf so I guess I'll be set. Gertie, Do you knit? There are so many cute slouchy berets that you could make that would totally channel Emma's vibe. I can knit a hat in an evening or two. oh my god, a pillbox hat! why did i not think of that??? pillbox hats are, like, the only hats that look good on me. Super cute gloves! The owl brooch is adorable and the perfect decoration for the wide lapels. Accessorizing a sewing project is so much fun! I feel like if I spent a long time on a project, it deserves to be properly accessorized! I can picture lots of patterns I've seen for knitted long gloves on Ravelry perfectly complementing this sleeve length! Is is wrong that I love to brag about things I've made so much!! !